Fort Hood, Texas. Just before the star of an Army Brigadier General was pinned on his uniform in a ceremony on August 6, 2014, at Fort Hood, Texas, Colonel Viet Xuan Luong, the 1st Cavalry Division’s Deputy Commander for Maneuver, remarked to the Army Times, “It’s a personal honor for me to be promoted to the rank of general officer, but I don’t want the promotion to be too much about me. It’s a tribute to my soldiers and [noncommissioned officers], the folks who’ve worked to get me where I am.” The program, attended by Luong’s family, was officiated by Lieutenant General Mark Milley, Commanding General of the III Corps. 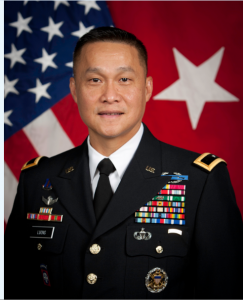 Brigadier General Luong, a political refugee who came to America in 1975 at the age of nine, is the first Vietnamese American to achieve flag rank and becomes the 117th Asian Pacific American promoted to this status. Luong and his family which included eight siblings left their home in Saigon (now Ho Chi Minh City) on April 29, 1975, one day before the city fell. BG Viet Luong, pinning on ceremony. 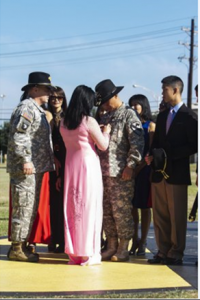 Left to Right: LTG Mark Milley, Commanding General, III Corps; Minh Albano, sister; Kim (pink), wife; BG Luong; Minh Jacqueline Luong, sister; Brandon, second child. The major portion of his 27 years of service has been in command of troops both within the United States and overseas. “Those were the most challenging times for me,” he said. “I’ve lost so many soldiers, and that has always been part of what the future has in store for me, in trying to really get people to understand that freedom comes at a pretty high price. For us who’ve lost troops in combat, it’s very personal,” he told the Army Times.